On the flight in the view below gave me a clear slice of the topography of Portugal. I was able to see the giant ripples of the land masses but couldn’t for the life of me make out how mere humans navigated them. We were flying north to south and most likely directly over the Caminho so I presumed at some point my curiosity would find itself well and truly answered as I spent days cresting each leg busting one of them. The plane approached the coast over Lisbon and carried on, passing the long bridge out of the left widow and out over the sea. The segments on the plane’s wings came to life as the hydraulic sections pushed themselves into the airflow and we slowed, turning a full 180 degrees and completed the descent over the city and into the airport. What a great way to start. We emerged into the baggage hall and walked to the left where the oversized items came in via a long straight conveyor belt onto rollers, no going round and round a carousel for our bikes. We didn’t have to look far to build them as this part of the hall was spacious and out the way. I was stood at the very end of the rollers whilst families started to gather waiting for pushchairs alongside a pile of broken pushchair parts. You can imagine the relief as the boxes were produced intact. We slid them into the corner and started to build. Lining up the pen marks I’d drawn round the handlebars at the stem and the seat post saves a lot of hassle. The fact that once I’d drawn them on at home I couldn’t remove my seat post from the bike’s frame and ended up taking the saddle off so as not to damage it when I placed the bike onto the work stand and started surgery with a hammer meant that the fore and aft position of the seat was something I’d just have to guess at and re-adjust en route. A little ride around the corner of the baggage hall was enough to alert a cleaner who came over and took our boxes from us, dragging them back towards the way we’d entered and disappeared around the corner. I’d already looked around for a place to dump them and failed so if you do this trip that’s going to be the right direction to drag them! Leaving the airport was a little confusing. As always you follow the crowds out only at this point we are pushing our bikes ready to roll. I’m wondering about is minor adjustments like straightening the bars and micro-adjusting seat height. Whether I needed my sun glasses just yet, had I forgotten anything? I have a problem with snapping rear spokes, more a case of when than if….. so…. when? The weight of the panniers and my tire choice, sticking with 25’s rather than my commuter 32’s. Oh bugger it I’m here now. Clip clopping towards the door in shoes I’d worn for only a test ride on the pavement and a new take on placing the cleats further back on the shoes towards the back of the ball of my foot. Out into the sunlight we go crossing gingerly through the lines of suitcase wielding travellers waiting for their transfers and onto the roadway outside. More of a pick up point than straight into Portuguese roads but still this felt out of the frying pan into the fire, this was busy. OK, straight over the crossing and onto the grassed area opposite. Let GPS find signal. Realise I hadn’t plotted the route to the hostel. It was, after all on Google streetmaps a straight road into Lisbon and only a kink on the map for this road to run straight alongside the hostel in the Baix area of town, how hard could that be? We just needed to fire off in the right direction and head downhill? Towards the sea? From the grass and the shade of a tree I looked towards the road network leading away from the pickup point and it looked like it went straight into a Motorway junction. Right, so that long road may well be one of those I don’t want to experience ten minutes from leaving the airport. The GPS beeped at me, found a signal and was waiting patiently, I found HOME hostel on the map (the big blue flag I’d pre-marked all the hostels I could find with) and told the Garmin to navigate us there. Off we went. Glen asked from behind which side of the two lanes we should favour as we drifted about trying to find our feet. I took to the right side and fairly soon came to a ramp up to the first roundabout. The paving strip (very narrow) to the side was made from small cobbles. I decided to get off and walk. Not sure why. I think I felt that at this point Glen was following me as blindly as I was attempting to read that tiny screen in the sharp daylight. Traffic seemed to be emerging from directions I wasn’t used to so I walked. At the top of the ramp I turned and crossed like a pedestrian. Then found a cycle lane which was just a pavement split in two by a white line, we descended a little back on the bikes and passed a flight crew walking towards the airport pulling their small flight bags on wheels. I felt like we were still within the confines of the airport so I took my time and just mentally ran through a check list of how my bike felt to ride again. Soon we got to another large and unruly roundabout. Vehicles were changing lanes at the last second and sitting in the middle causing a back up until someone else let them in, A van decided not to take an exit and swerved towards the lane it had just left, waiting to be let in whilst the others behind ground to a halt. I was surprised we didn’t witness an impact. Glad I’d decided to mount the pavement. Across on the far side I could see from the map the route exited on a more minor road and up a hill. The kerbs were high and the paving around them small white cobbles, walking again. Glen and I frequently exchanged glances that signalled to each other our surprise at this environment, a cyclist appeared on the other side of the roundabout and crossed at the red lights. He was on a mountain bike. THAT made sense, Pffft. We crossed and I noticed a metal disc with a cycle on it amongst the cobbles. This was a cycleway too? Finding our way onto the right exit we mounted again and started climbing the road away from the roundabout, on a cycle lane adjoining the pavement, made of UK standard cycle lane material, wide enough for bikes. I was a little disappointed! We followed the auto routing on the GPS as it started to take the piss. I tend to get a little frustrated when I lose control like this and I’d put my faith in this gadget without knowing if the next turn is off a cliff. 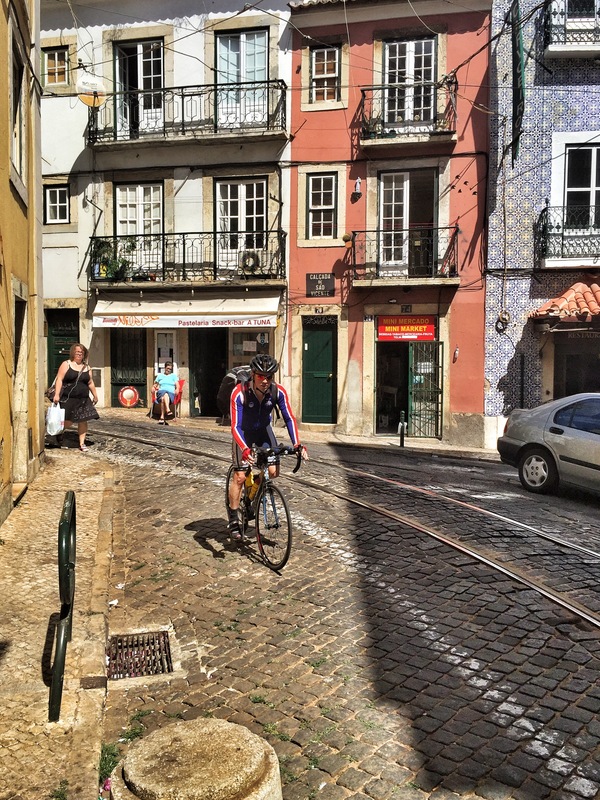 The roads slowly turned into cobbles and the initial downward gradient was exchanged for a good dose of steep sections and before I knew it I was in rustic Portuguese crumbled amazing-ness, the Graca/Alfama. Riding on streets untouched for years apart from the invention of the car and the stains of pollution they bring. I’m sure it was the motor vehicle to blame for the road surface as at some point they had a great idea of burying the cobbles in tarmac. Well thank god the cobbles are fighting back. all around the tram lines which incidentally joined us with vengeance and twisted along the roads making you bunny hop and wiggle the bike to cross them cleanly without mishap the cobbles are breaking through and rumble under the wheels of the cars which infest these streets like cockroaches. The buildings closed in towards the road and their crumbling rendered facades occasionally gleamed in the sun with glazed patterned tiles. All above stretched cables, the power-feed to the trams which occasionally would stop us in our tracks as we jumped to the pavement to take in our surroundings. An elderly lady crossed slowly and I waited as she negotiated the high and irregular stone slab kerb, she took an age and thanked us for waiting. We hit a stalemate between two trams on a hill and watched to see how it panned out. This was all just a bit brilliant. Except for one concern. I think Glen was undecided about the road surface. Imagine a flat cobbled road. Now picture a motorboat ploughing through and the cobbles rippling behind into a wave like formation. That’s what the years of wheels had done to these roads. So for 700cc road wheels which could pinch flat on each missing cobble and slip easily into the tram tracks this was time to watch the roadway constantly for the next few meters infront and not up at the developing landscape. Glen slowed, his road geometry and stiff frame build must have been screaming at him, my steel cross bike seemed to love it or maybe it was my years of off road riding, I considered this fun. The splashed tarmac continued and the pavements narrowed and filled with tourists. I looked at the mapping and despite doing the total distance I’d figured that straight road to be it looked like the winding route was only half finished. Suddenly, the street opened out to our left and I could see the horizon. We’d ridden onto Largo das Portas do sol from R. Sao Tome. I almost forgot we were near the sea. The hillside was steep so to our left a section of smooth paving slabs and railings then roof tops below, the view beyond. Haze in the distance yet blue above. That fresh air feel that the sea often brings. Smooth paving slabs, Glen will like this, so I stopped. Pavement vendors under colourful parasols and people just relaxing. I was tempted to buy a beer from one of the vendors but I took a few photos instead and Glen announced he was going to walk for a while. We passed the statue of Saint Vincent of Saragossa (São Vicente de Fora) the patron Saint of Lisbon. Holding in his left hand the ship and ravens, synonymous with his martyrdom and the shield of Lisbon, in his right hand a quill, I’ve no idea why. So we moved on and pavement hopped amongst the now steady stream of pedestrians. I tried cycling slowly the thin strip of cobbles between the tram track and kerb but the pavement was too thin for those walking on it and they kept stepping out into my path. How those passing trams keep traction as they climb/descend and brake for the stream of cars and tourists I’ll never know. These roads kick up and dive like a roller coaster. I recognised the rear of the Cathedral. Bold and fortified with its twin bell towers and rose window to the front it blends well with the street scene with its whitewashed walls and piecemeal construction from the back. Twisting around it we carried on to the bottom of the hill and enter the edge of a grid pattern of roads and walkways. The Baixa. I’m stood where I know the hostel should be. Before we left England I tried to get a good view of the hostel front using google streetview but the camera didn’t go onto the pedestrian section so I was none the wiser when we arrived. After a few minutes of looking I found it. The doorway has a neon sign over the door and a large info board on the wall to the side. Also a large red mat screwed to the floor in front. But I missed it. If you use this hostel and turn out to be as thick as me just look for the larger “Liane” sign over this which dominated my attention each time I looked. That’s my excuse and I’m sticking to it. This is a multi-use building with the winding stairway up the middle. Glen stayed in the lobby with the bikes as I ran up to the second floor and asked about cycle storage which turned out to be next to the reception. A man was also in the lobby holding a torch to a hole in the wall when I returned. I didn’t realise at this point but he was actually at the door to the lift. Meanwhile we started to lug our bikes up the winding stairs, fully packed and the weight of a mule. The first floor looked like a clinic of some sort so at least I’d be able to seek treatment for a hernia or slipped disc on the way passed. Second floor and the lift dinged and a girl stepped out with a massive suitcase; let’s pretend the bikes wouldn’t have fitted…. The man at reception was a dude. The main door to the hostel is opened with a watch/fob or the doorbell, to the right inside he opened up a narrow door into a corridor, along which appeared to be doors to offices. We were assured the bikes would be safe and because they were inside the locked door I was happy with that. I removed my panniers and we went into reception. We all had a shot of something tasting a little like Port and in that moment he set the relaxed and welcome scene for the rest of our stay, as more travellers arrived I guess he just ended up drunk at the end of the shift. Reception is a bar with a long table to the right, easily able to sit 10-15 people depending on how friendly they feel. at the end was a rather plush chair we presumed to be “Mama’s” chair. from the website I learnt that each night Mama made a meal for guests who chose to book in. Her food was raved about on both the site and reviews on Hostelworld so when booking I thought it would be a no-brainer to sample local food conveniently after the long journey. We put our names on the list, but declined the opportunity to go on the guided pub crawl afterwards, I wasn’t sure at that point if Mama was a party animal too but I was too tired to ask and was happy with the fact I wouldn’t be awake to find out. The guided tour of the hostel included a lounge, computer room (where I couldn’t decide if they loaned you a laptop, I only saw one type being used by a few people and ended up confused as to why a room was needed for it. Either way it was a nice room which was more likely used as a bar extension) to the rear of the floor was a sitting room and a laundry with kitchen and outside seating/smoking area. All good, very clean and stylish. I got the impression most visitors were booked in for a number of nights, not like us, just passing through. We were given our room number and beds and took our baggage to the fourth floor to another keyfob door. the room itself had another fob entry and our bunks were in the room near the open window. bliss. I chucked my stuff onto the top bunk whilst noting there were large storage bins under the bottom bunk with a hasp, just needing a padlock to make it secure. Should have brought a padlock….. still, I’d packed in such a way that my important stuff would go in the bum bag and I’d be leaving nothing behind. Looking around at all the personal belongings of the other residents strewn about the room I should have just lightened up but It’s just good sense not to start out by leaving all your valued kit about. I didn’t bring anything I didn’t need so falling foul of just one light fingered moment could mean an extremely difficult week ahead. Glen had brought a rucksack and had spent a short while seperating his money into plastic bags and depositing them about the nooks and crannies in his rucksack. Incase someone steals half his rucksack (Har har!) still, it made me feel like if I lost my bumbag I’d lose everything so maybe I’d just not take the piss out of his security measures yet! The bunk nearest the window had a guy asleep fully dressed on the top. Didn’t think much of this other than if he was stopping a while surely there was loads to do and see. He didn’t flinch, well out of it. It was obvious a girl had unpacked and was using the bottom bunk and the rest of the room/mirror/table/floor space as clothes/makeup/bag storage. We needed Credentials, the pilgrim’s passport in order to gather stamps and make the journey official. Register our pilgrimage. Mama’s meal was at 8:30pm so we had a couple of hours to sort this and sightsee. We left the Hostel and walked back towards the cathedral. I began to wonder if my minimalist slip on shoes were such a good idea after all. All the pavements in this area were small cobbles only a couple of inches square each and the ridges could be felt through the soles. My cycling shoes have always been the off road variety anyway meaning the cleats are inset in the soles. I could walk on them if I needed to so we’ll see how we go. Approaching the Cathedral from this side was much more of an occasion. As you climb the hill towards it the Romanesque stone structure seems smaller than many other cathedrals but none the less imposing, it’s castellated bell towers really give it prominence over its surroundings. The desk issuing credentials is situated right next to the front door as you turn right through the wooden vestibule, but be sure to stroll straight passed this and ask at every other desk first like I did. A man with heavily tattooed arms spoke English much better than my Portuguese so we registered and paid the 1.5 euro without complications and he included a small sheet containing Accommodation information. The first stamp went in the credential: 5th September 2015. We had a discussion about the availability of floor space from the fire service, something he found quite accepted but I still cannot see a link. Why the fire service? What is their charitable link to the pilgrimage? I would have loved to have experienced this though but it was the last time we thought of it the whole trip. It’s worth mentioning this is a multi-caminho starting point including the Portuguese pilgrimage to Fatima. Separate lists…. I’ve got a soft spot for religious architecture and enjoyed looking around the interior. Most of all I enjoy people watching and it was obvious here that the mix of visitors pointing cameras was outweighed by those who were lighting candles and sitting quietly in the pews. Contemplation was evident everywhere in contrast to the bustle outside. The display of ecclesiastical robes in a room opposite the Chapel of the Sacrament is worth a look if only for the opulence of the room housing the display. You can peer through a locked glass door. As we left we cut down side streets and away from the traffic. A steady stream of cars still managed to find us as even on roads the width of a walkway it would seem its fair game to cut through in a car. We were drawn towards the sea. It’s a funny thing that I’ve associated crossing a country end to end with dipping my feet in the water either side. Not in a literal sense but at a port that’s where the action can be found anyway so Glen led the way. We picked our way through very narrow streets and eventually got there. As we crossed a carpark a man approached with his outstretched hand, in it i could clearly see a bag of cannabis. I was offered this and it made me laugh as the guy was quite open about it. I am aware of the relaxed laws on drug use and it was something I’d read about just because I’d come across it whilst researching the Caminho, that wasn’t why I laughed. Every time that happens I often wonder why the person with me isn’t offered drugs. Why me? out of the two of us? do I look like the entertainment rep out of the two of us? wierdest thing is he spoke in English to me straight away. How English do I look? feeling now like I’m an obvious tourist who likes the occassional high we walk along the front of the ferry quay and turned onto the vast Praça do Comércio. A group of hired segway riders are in stitches on the far side near the archway (Arco Praca Comercio) as one of them falls flat and the rest of them struggle to position their own segway to get a good selfie with him in the background dusting himself off. The traffic is controlled by two Traffic officers and flamboyant hand movements protecting the walking masses from being hit by cars as they look up at the architecture. As we cross throughout the arch and into the pedestrian area the one thing that strikes me is the quality cobble work on the floor (Casa Chineza 274-278 *******). So smooth and glossy having been polished by millions of shuffling feet. The street artists were out. One playing a cello to a pre-recorded backing track. Another had a large crowd captivated balancing a glass ball. My attention is always a little on the lookout for the darker side and that part of me couldn’t see any element of the crowd I’d be wary of. Some float as if watching the backs of spectators, circling like vultures and my alarm bells ring. Not here. I just felt at ease and hungry. Pastries. Everywhere. Shops so established their name is written in the cobbles of the paving in front of the shop. The prices are a pleasant surprise. That was a recurring theme everywhere. Reasonable prices. The first Pastry to catch my eye was the Pasteis de Nata ( http://etramping.com/taste-of-lisbon-best-portuguese-desserts/ ) which if you’ve got a local Nandos restaurant will need no real introduction! Later on in Porto I found a shop where you could order it according to how burnt the surface was. They also served it with a dusting of cinnamon. We bought something that appeared to have custard running through it and walked the streets to stretch the legs a little longer. I was quite glad we’d sorted our evening meal as the choice was astounding. The pavement cafe/restaurants were just starting to wind up for the evening and people were reading the menus. 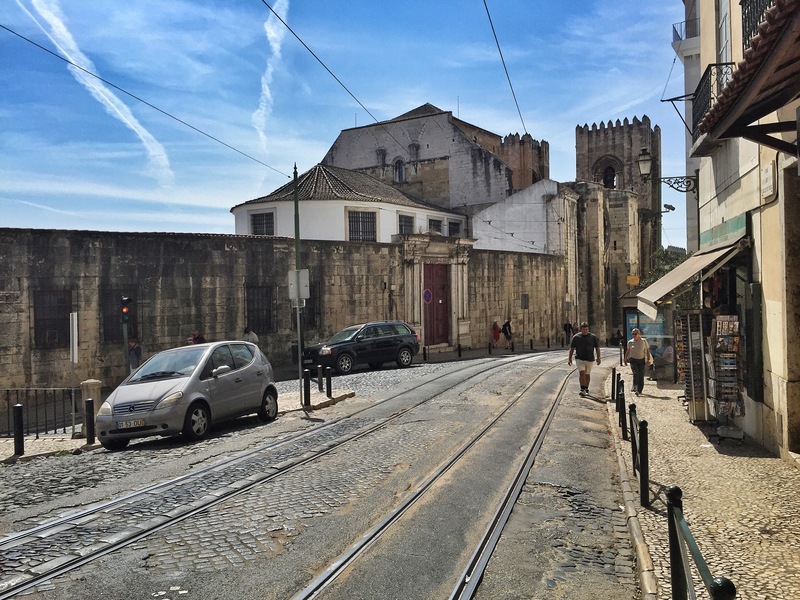 We stayed within the Baixa and completed a circuit back to the Hostel. Sleepy guy was still flat out on the top bunk. It was about 8pm. Bottom-bunk girl had returned and was dressing for Mama’s dinner. I felt a bit too casually dressed but at least my one t-shirt and pair of shorts were clean even if the slip on neoprene shoes didn’t exactly match the outfit. Bottom-bunk girl leaned over and told us sleepy guy had slept in his clothes last night too. I wondered if I should check his pulse. We went down for dinner instead. There was quite a crowd in the bar area and we took a small round table instead of “S’cuse me-ing” along the big table. I felt a bit old as the room filled up. But the atmosphere soon kicked in and we forced a Canadian (Reece) to sit with us and match us plate for plate on going back for seconds. We had green Pea and lettuce soup with mint, traditional cod fishcake but served loose with potatoes, boiled eggs and a warm salad, salty, nice. With raspberry cake and lashings of scrumptious ale to wash it down. Well, lager. We broke the ice by playing dares at biting the wax fruit in the display (a Canadian idea) Mama if you are reading this, we didn’t (we did). The food was amazing and just what I needed to prevent me eating my own foot through the night. I’ve stayed at a few hostels now and the meals are nearly always a three course affair. I don’t know how they do it for the money they charge, I’m just glad they can! The open window in the bunk room reminded us that the streets below were alive with people. Being on the edge of the Biaxa the road to one side wasn’t pedestrianised, the vehicles sounded like rain on the cobbles. Lisbon seemed like it would be a different experience at night. Another time. Previous Post Personal safety on the Camino de Santiago following the tragic death of pilgrim Denise Thiem on the Camino Frances.